Following a succession of jewellery heists, celluloid candelabras, slightly stained red carpets and torrential rain, Cannes finally witnessed perhaps the classiest act of all. 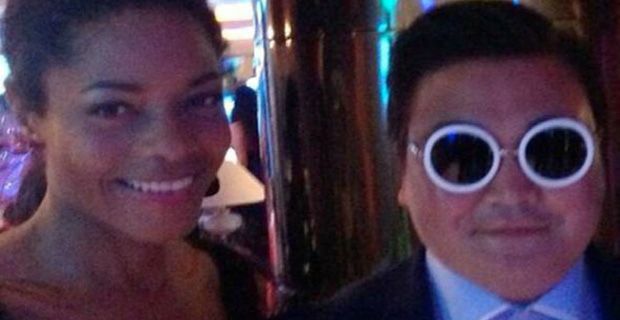 Step aside Leonardo – out the way Spielberg, the fake PSY is on the town. Yes, a short, tubby and suitably flamboyant Korean bloke has been tearing up the galas at the Cannes Film Festival downing as much free champagne as he can fit down his gullet. A man – sorry – criminal genius – has been impersonating the rotund bundle of dancefloor goodness. Conning organisers, stars and hangers on alike, the man has managed to strut into a glittering array of A list parties and exclusive soirees up and down the Croisette, appear on French TV, show French radio how to dance Gangnam Style and sign a deal to perform in Monaco. Galloping through the ropelines surrounded by three security guards who by all accounts were bristling with earpieced efficiency, he drank the Torch Beach Club dry before heading off to a party hosted by socialite Goga Ashkenazi at Château Garibondy, where the guest list included all kinds of B to C list celebrities. Skyfall actress Naomie Harris was so starstruck when she met our man at a party thrown by heist victims Chopard that she instantly tweeted a photo of them together. Sadly, every piece of theatre must eventually succumb to the curtain, and as soon as word leaked back to the real PSY, the game was up. Good lad. Took it in the right spirit.